I enjoyed Lies Beneath. need to catch up on the series. Enjoy your reads. I love the cover for Lies Beneath, it's really beautiful. Hope you enjoy all your books. My STS. One of these days I'm going to read a Sarah Dessen book! I swear it! LOL. Dreamland has a pretty cover, so I'll be curious to see how you enjoy that one Emily! Shadowplay looks really cool! I love that cover. 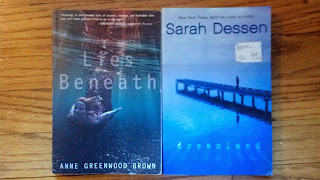 Ooh Lies Beneath was a good read! I enjoyed her take on mermaids!